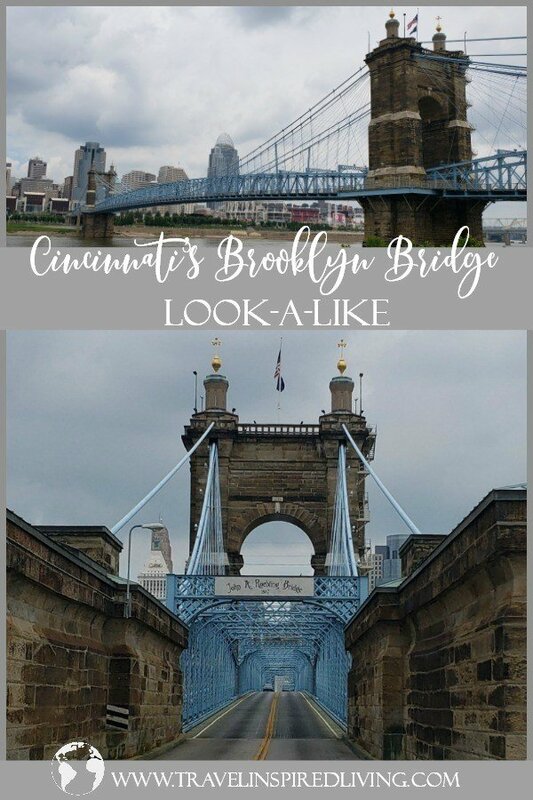 Designed by architect John Roebling, the Roebling Bridge opened to traffic in 1867 and was the longest suspension bridge in the world at that time. 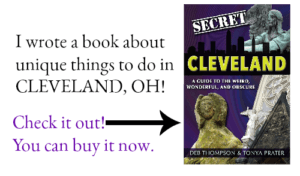 Prior to this time, travel from Cincinnati to Covington, Kentucky was by ferryboat. The bridge has been standing longer than we have been driving cars, which is pretty incredible to think about! Roebling’s bridge has undergone many overhauls and renovations over the years, to keep up with changing travel and technology. In 1899, the bridge was reinforced to withstand heavier loads, as electric streetcars replaced horse-drawn carriages. In 1901, electricity was added to the bridge. Two years after the Roebling suspension bridge opened, John Roebling went on to New York to build the Brooklyn Bridge. 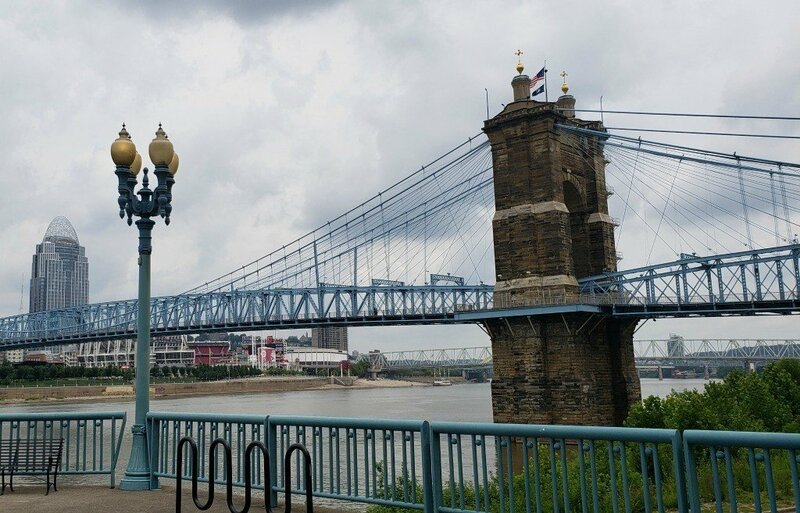 The Roebling Bridge is now a National Historic Landmark, and a National Historic Civil Engineering Landmark. 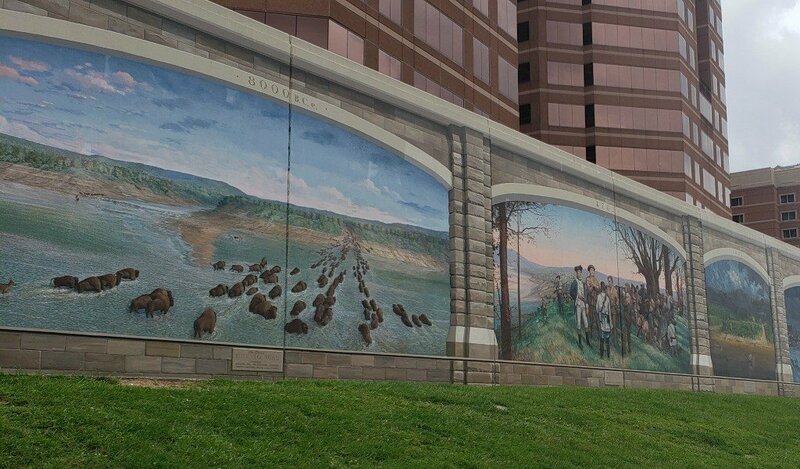 It still serves as a pedestrian and vehicle bridge from Ohio to Kentucky. 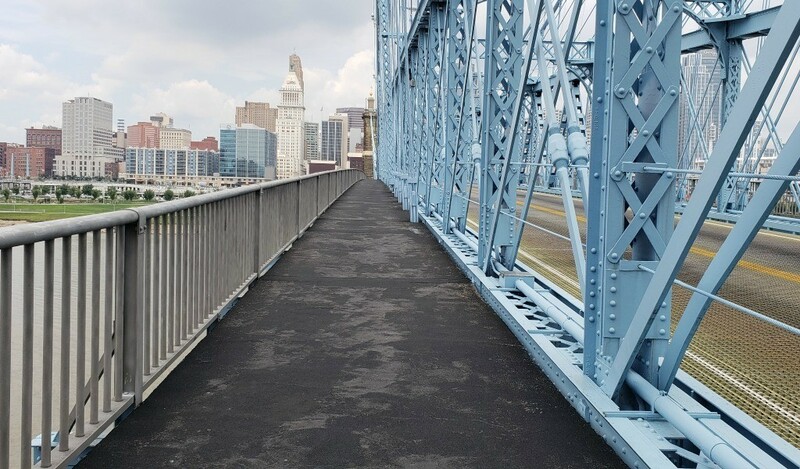 Vehicle traffic is more prevalent on newer bridges crossing the Ohio River, but anyone passing through Cincinnati should take the opportunity to stop and stroll across the bridge. 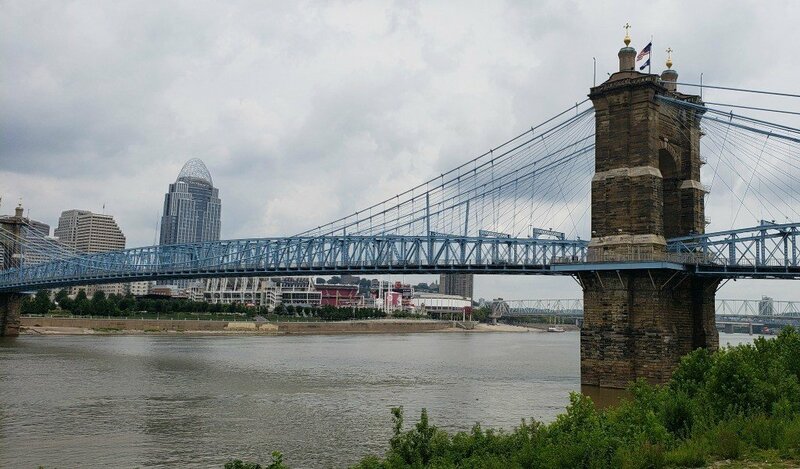 Both Covington and Cincinnati have riverfront entertainment districts, connected by the Roebling Bridge. In 1984, a fundraising campaign installed decorative cable lighting, which is still maintained with donations. 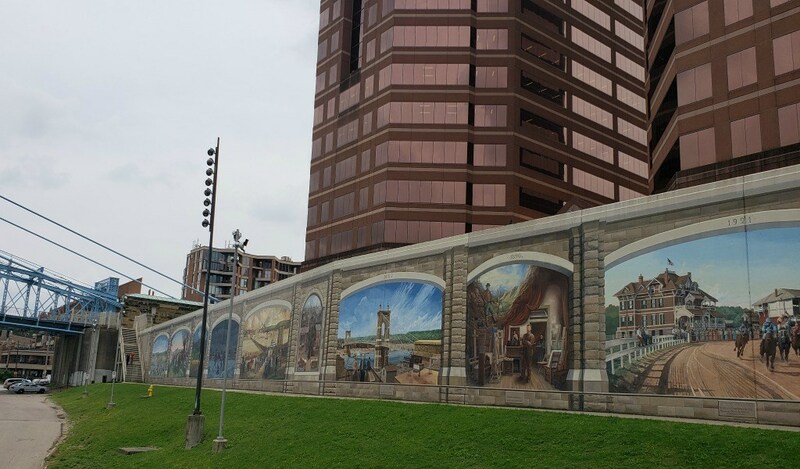 In 2010, the bridge was painted in a custom color now called “Roebling Blue.” Another interesting attraction at the bridge is the Roebling Murals painted under the bridge on the Kentucky side. 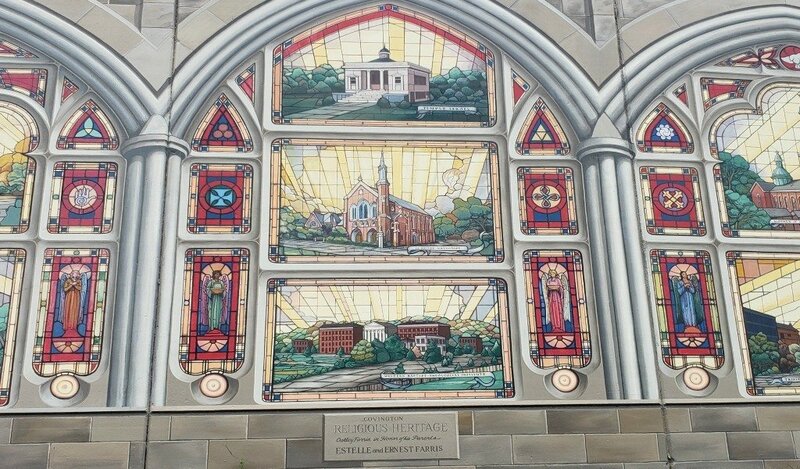 18 murals depict the history of Covington from 800BC to present day. Photographers visiting the Cincinnati area should be sure to visit the bridge at night, as the cityscape and lighted bridge are quite photogenic. That scene is on my list to capture next time I pass through the city at night. 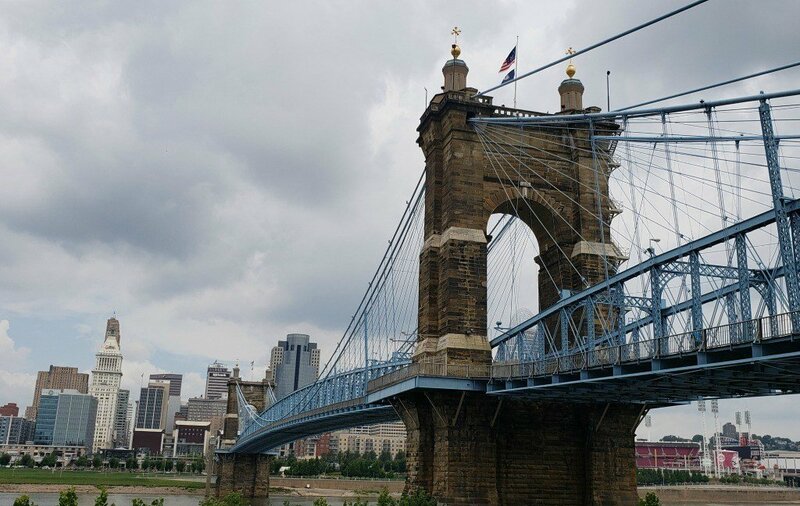 Have you ever driven over the Roebling Bridge in Cincinnati? Or better yet, walked over it?